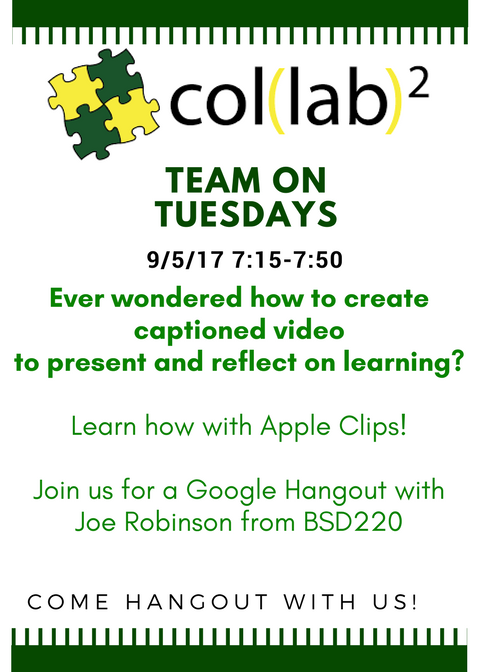 The Collab Blog: Create and Reflect with Apple Clips! For our 3rd in the series of Team on Tuesday Professional Learning experiences we were excited to connect via Google Hangout with Joe Robinson, the Instructional Technology Director from Barrington School District 220. Teachers from EG joined us in person in the Collab Lab and we also connected virtually with colleagues from Rolling Meadows High School and Prospect High Schools to learn from Joe's examples. He demonstrated just how easy it is to build a video clip with photos and video, and edit the clips with filters, emojis, animated graphics. We were especially excited about the speech to text feature! 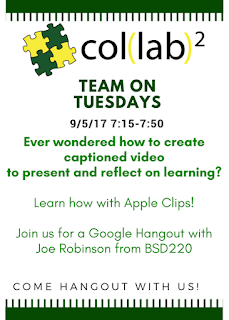 As we watched Joe's step-by-step demo, we had time to experiment on our own, ask questions, and explore possibilities for how we could use Apple Clips in in our own professional learning and in our classrooms. Since we were learning about Apple Clips, I thought a good way to share what we learned would be to make my very first Clip! If you are familiar with Adobe Spark, you will find that this tool is as easy to use with even more functionality. There are so many possibilities to use this as a tool to create, share, and reflect on learning. Want to learn more? Want to brainstorm possibilities? Do you have examples of your own to share? We'd love to connect with you! For more examples, check out #AppleClips on Twitter. A huge shout out to Joe for taking the time to connect with us! Team on Tuesday this week reminded us of the power of collaboration and how technology can support those learning connections across disciplines and beyond our school walls! It was a pleasure to connect with some Grenadiers, some Mustangs, and some Knights. I look forward to continuing to learn with you all!